Lexwell & Partners is a full-service professional law firm dedicated to providing efficient, innovative and commercially driven legal solutions. The firm has earned an excellent reputation on the Ukrainian legal market among clients and peers. The professional level of Lexwell & Partners as well as the projects in which the firm has been engaged is highly ranked by Ukrainian Law Firms, LexQuorum, The Legal 500, IFLR 1000, Kyiv Post, Yuridicheskaya Practika Weekly, Yurgazeta and others. Since the time the firm was founded and the years afterwards (2005 — 2016), leading Ukrainian legal periodicals listed Lexwell & Partners among the Top 5 Ukrainian law firms ranked by revenue per lawyer. In 2008 the firm took first place in the Ukraine’s largest M&A deal rating (USD 3 billion); in 2009, 2012 and 2016 — in the largest litigation case rating (over USD 1 billion). 20% of the top 10 cross-border M&A transactions in Ukraine published by Forbes in 2013 were handled by the lawyers of Lexwell & Partners. In 2014 the firm earned first place among Ukrainian law firms by revenue per lawyer. 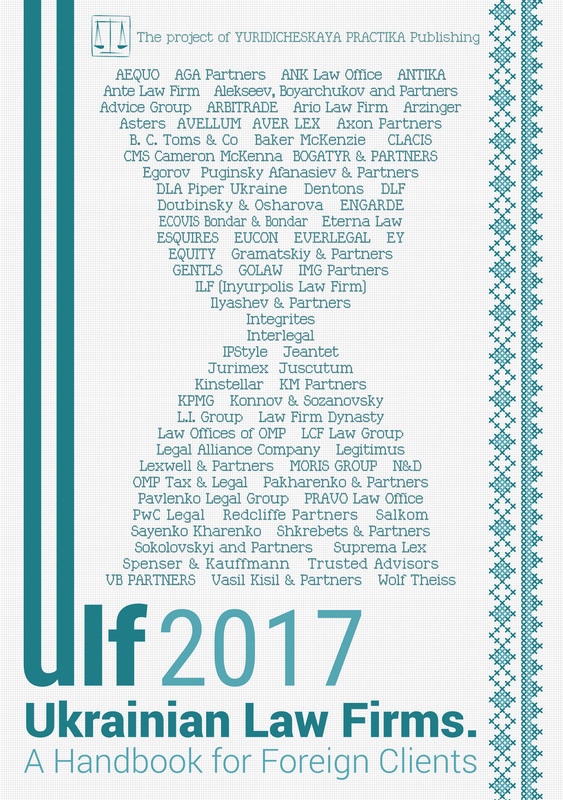 In 2017 the Tax Office of Ukraine included Lexwell & Partners in the Top 10 list of the largest taxpayers among Ukrainian law firms. Lexwell & Partners key clients are multinational and leading national companies, including ABN Amro, AET, Amstar, ArcelorMittal, Bridgestone, Bunge, Cargill, Chicago Mercantile Exchange, CRH, DuPont, East Metals, Eurobank, Evraz, Honda Trading, ING, Interpipe, Intesa Sanpaolo, Pfizer, PHV (Calvin Klein and Tommy Hilfiger), PwC, Red Bull, Marubeni, Millhouse, Morningstar, Naftogaz Ukrainy (State-owned Oil & Gas Company), Schenker, Sojtz, Subaru, Sumitomo, Suzuki, Toyota, VS Energy. The firm also advised the Government, the Office of the President and the Ministry of Justice of Ukraine. In 2016 the same destabilising factors that had had a negative impact on the Ukrainian economy in the previous two years remained in place. Although in general terms the Ukrainian economy adapted to the conditions that emerged in 2014 (due to loss of control over a large area of territory by Ukraine and the related loss of a substantial part of its manufacturing sector), attracting foreign investment and creating favourable conditions for business are of a great importance for the country. It is worth noting that the Ukrainian Government took certain steps toward economic reforms with the aim of improving the investment climate in Ukraine. But the results of these efforts have been quite modest so far. Despite notable improvements in the legal regulation of some industries, the overall situation is rather complicated. The Ease of Doing Business rankings for 2016, according to which Ukraine occupied 80th place among 190 countries (improving its previous result by just three positions), is yet more proof of this. 2016 brought no fundamental changes in the legal regulation of investment activity in Ukraine. Moreover, many of the restrictions that were imposed by the Government in previous years, due to the difficult economic and political situation, were continued for 2017. Thus, for instance, the National Bank of Ukraine, by its Decree No. 410 of 13 December 2016, continued restrictions on the money and foreign exchange markets of Ukraine introduced in 2014-2015. Thus, the requirements for the mandatory sale of 65% of incoming hard currency, a 120-day deadline for payments for exported and imported goods and the ban on early repayment of loans from non-residents etc., remained in place. However, some restrictions were lifted in 2016. For example, since June 2016 the National Bank of Ukraine has allowed the purchase and transfer of foreign currency abroad to return dividends on interest/shares for 2014 and 2015 to a foreign investor (though subject to certain conditions to be met simultaneously). On 31 May 2016, the Ukrainian Parliament adopted the Law On Amendments to Certain Legislative Acts on Abolition of Mandatory State Registration of Foreign Investments. If there were a change in laws relating to the guarantees for foreign investments protection, the state guarantees provided by the law may be applied in the next 10 years if a foreign investor requested so. Protection against expropriation. Foreign investments in Ukraine shall not be subject to nationalization. Also, foreign investment shall not be requisitioned except for as an emergency measure taken in the event of natural disasters, accidents, epidemics, epizootic situations. Foreign investors have the right to recover damages, including lost profits and moral damage, caused to them due to the actions, omissions or improper performance of their legal duties relating to a foreign investor by public bodies of Ukraine or their officials. Interest is charged from the day when the right to compensation arises to the day of its actual payment on the amount of compensation to be paid to a foreign investor at the LIBOR rate. In the event of termination of investment activity, within six months from the date of termination, a foreign investor has the right to return an investment in kind or in cash in the currency of an investment in the amount of an actual contribution with no requirement to pay any state fee or duty, as well as to the return on these investments in cash or as commodities at their real market price at the date of investment. After payment of taxes, duties and other mandatory fees, foreign investors are guaranteed a free and prompt remittance abroad of their profits, revenues and other funds in the foreign currency obtained legally as a result of foreign investment. Regretfully, the Law provided for the state registration of foreign investments under a special procedure. Essentially, the registration was not mandatory as no penalty was provided by the Law in case of failure to register a foreign investment. The Law, however, determined that unregistered foreign investments got no right to the privileges and guarantees stipulated by the Law. Furthermore, even though the procedure for the state registration of foreign investments was not too burdensome, the ambiguity of Ukrainian laws regarding the types and forms of investments often led to a failure to recognize certain types of foreign investment as an investment in terms of the Law and, hence, a denial in their state registration in practice. In addition, there were cases when a foreign investment was excluded from protection with reference to the fact that the investment is not registered. This situation clearly worsened the status of foreign investors and, therefore, the complete abolition of the state registration of foreign investments is certainly a positive step. Moreover, this institution was no good for investors or the country. In 2016, the Cabinet of Ministers of Ukraine made efforts to create institutional mechanisms that would function within Central Government and promote investment and protect the rights and interests of investors. Thus, several public offices were established that apparently were intended by the Government to facilitate cooperation between the Cabinet of Ministers of Ukraine and other public authorities and private investors, especially foreign investors. In particular, a relevant office was established to attract and support investment by Resolution of the Cabinet of Ministers of Ukraine No.740 of 19 September 2016. The Ukraine Investment Promotion Office (the Office) is a temporary advisory body of the Cabinet of Ministers of Ukraine. The Office was established to facilitate interaction with public authorities and municipal bodies in the development and implementation of investment projects where foreign direct investments are involved. The main tasks of the Office is to create a mechanism for preparation and implementation of investment projects on the principle of “a single window”; to promote coordination of Ukrainian public authorities to address issues arising in the implementation of investments in Ukraine; to prepare proposals for the formation and realization of investment potential of Ukraine, support of priority investment projects, improving the investment climate in Ukraine, protection of investors’ rights; to identify ways, mechanisms and methods of solving problems that arise during the implementation of investment projects, etc. When this article was being prepared, the Office had not actually begun to function. So it is too early to gauge its effectiveness. However, given that the Office is empowered to review applications of foreign investors for their support in investment in Ukraine and provide such support, it could potentially make a positive contribution and assist foreign investors in investing in Ukraine. The Cabinet of Ministers of Ukraine approved the Regulations on the Government Agent for Investments by its Resolution No. 647 of 8 August 2016. The Government Agent for Investments (the Government Agent) is an official who is authorized by the Cabinet of Ministers of Ukraine entrusted to coordinate the Office’s functioning, perform tasks to promote the development and implementation of the investment potential of Ukraine, increase foreign investment, support priority investment projects, improve the investment climate in the country, protect investors’ rights, and ensure interaction between investors, relevant bodies of foreign states, international organizations on attracting investment with public authorities and municipal bodies in Ukraine. The Government Agent is directly subordinated to the Cabinet of Ministers of Ukraine. The main duties of the Government Agent Office are to coordinate the Office’s functioning, prepare proposals on the development and implementation of the investment potential of Ukraine, support priority investment projects, improve the investment climate in Ukraine and to protect investors’ rights. Therefore, the Government Agent is meant by the Government to be an important link between investors and the Cabinet of Ministers of Ukraine. The Reform Office was created by Resolution of the Cabinet of Ministers of Ukraine No.768 of 11 October 2016. The Reform Office is a permanent advisory body of the Cabinet of Ministers of Ukraine formed to ensure coordination and implementation of reforms at the proper level, including planning of necessary measures, monitoring and analysing their performance. The main tasks of the Reform Office are to ensure the proper level of organization and coordination of reforms; to prepare proposals for an action plan of reforms for the year in question and mechanisms for implementing such reforms; to monitor the status of performance of tasks listed in the action plan by central authorities; to analyze the results of performance of tasks listed in the action plan. The Central Reform Office will interact with regional offices which will open in all 24 regions of Ukraine.